So I had some chicken and wanted to try something new- turned to trusty old Pinterest for some inspiration. I saw a one dish chicken and veggies that took just about an hour to bake, didn’t call for crazy weird ingredients and could be easily modified. I decided to go with potatoes and broccoli for the two side veggies. I seasoned all well with a season salt type seasoning, some onion flakes and some jarred garlic. I mixed all this in a small bowl with a few TBSP melted butter and a few TBSP olive oil. I placed my chicken and veggies in the pan and drizzled with the season mixture. Topped with foil and baked for 30 minutes like that. So, I didn’t get an “after” pic- hubby dug into it! He liked this much better than I did. It was just an “okay” for me. The chicken wasn’t flavored as much as I would’ve liked and was a bit dry. The broccoli was mushy and the potatoes were really good. So, I will be playing with this concept- just changing it up a bit! 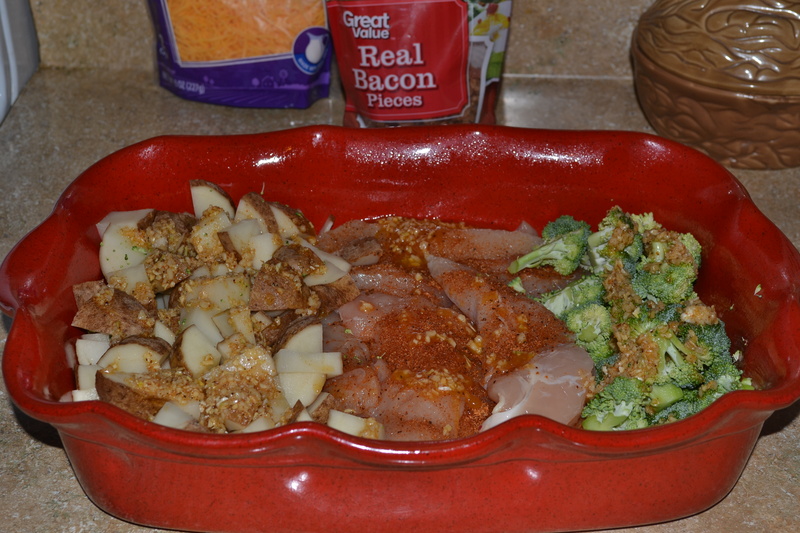 I am going to attempt it again- only next time I will marinate my chicken overnight in Italian dressing, I will use fresh chopped onions, and will only bake the potato chunks on the side (I will just steam my broccoli like I usually do). So- trial and error! The story of my life! Stay tuned for a much better (fingers crossed) version of this bake! In life we all have some ups and downs, some great successes and some super flops! Learning from our flops is the key! I hope all have a super Blessed week! It’s a cool rainy day here- feels like fall! God Bless! Looking for a filling, healthy, yet still super yummy supper? Look no further! You’ll get a whopping 2 big burritos per serving for around 500 calories. 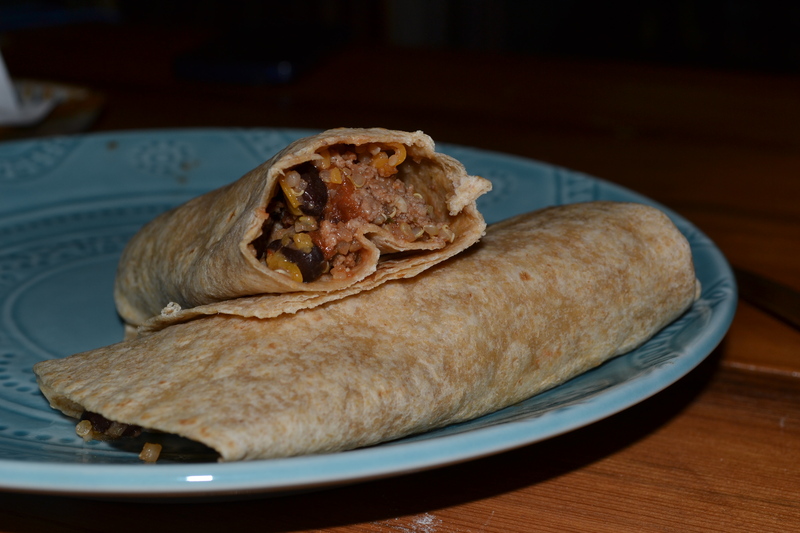 These burritos are packed with protein, they’re filled with ground turkey, black beans, quinoa,salsa, and a bit of shredded cheddar. I started with cooking and crumbling 8oz lean ground turkey,added some dry onion flakes, minced garlic and a dash of fajita seasoning.Then I drained and rinsed a can of black beans and added to the skillet. I then added about 1/2 cup cooked quinoa and about 1/2 cup salsa.This mixture was heated through. 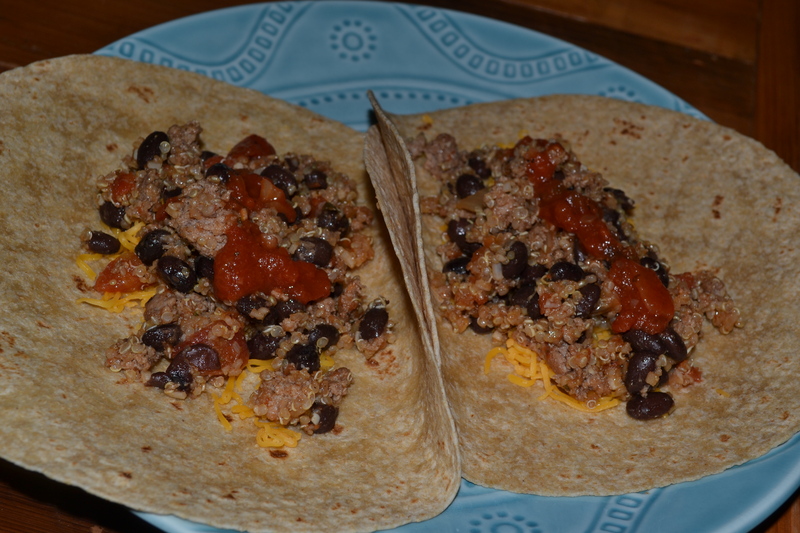 I used whole wheat tortillas, filled each with about 1/4 cup filling and added 1 Tbsp shredded cheddar cheese. These were so filling!! Hope all are having a super summer- it’s winding down!! I go back to work tomorrow- then school starts next week. My daughters’ wedding is also just 6 weeks away, so it’s getting hectic around here!! May all have a blessed week!! So it is that time of year- all those luscious fruits and veggies are coming off by the bushel! Time to do some preserving. Time to tromp out to the storage building and dig out my canning stuff. Time to heat up the kitchen for a good cause. Time to make some real, yummy foods! 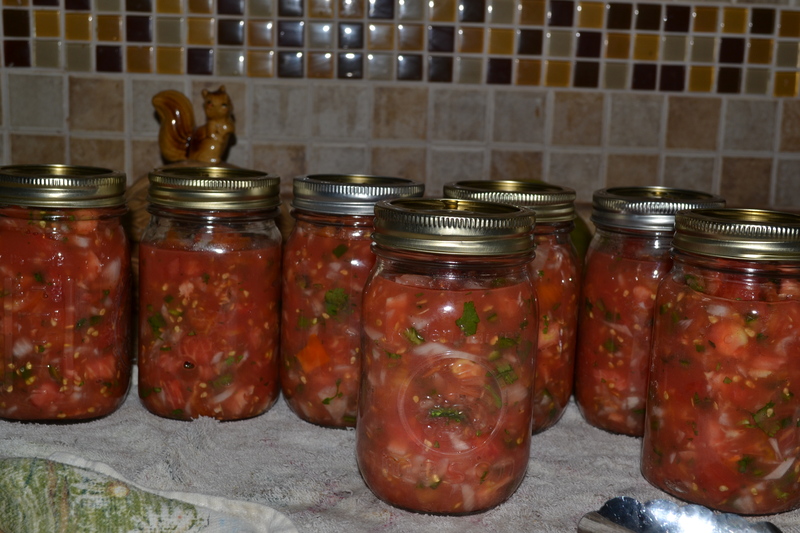 Now this day I made homemade salsa to can. I am planning to can diced tomatoes later this week. Then some peaches later in the summer. Look at all that yumminess! Around here we go through a lot of salsa, and homemade is always better! My bunch had to have a bowl fresh before I started to can it up! I start by blanching (just dropping into boiling water/followed by a dunk into ice water) my fresh tomatoes, then slip the skin off, core and chop into very small dices. Wash and chop all other ingredients. I use about 8c chopped tomatoes to every 3 small/medium peppers, 2 medium onion and a bunch of cilantro. I mix in a large bowl and taste. Now it seems a bit bland- but I add my salt to each jar so I know they each have the exact right amount needed to preserve them. I use 1/2 tsp salt per pint jar, added right before placing the hot band/lid on top. They then go into my pressure cooker to be pressure cooked for 25 minutes. Let cool on the counter on a towel. 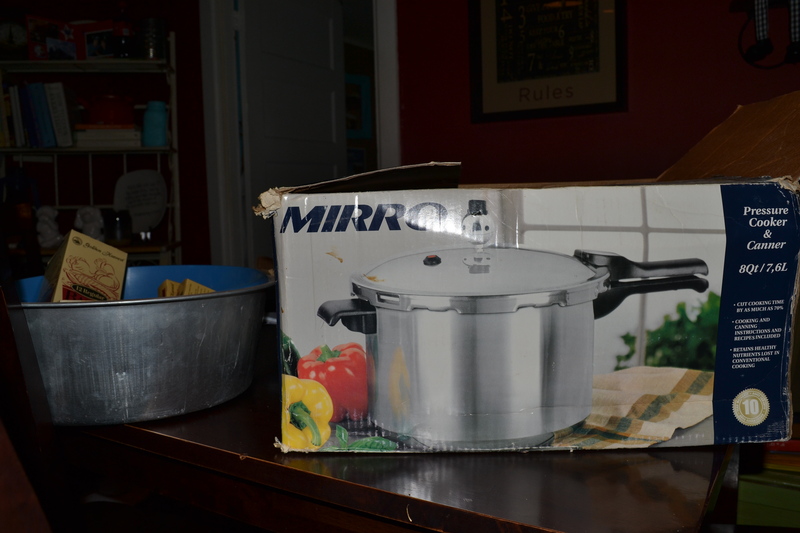 Don’t let a pressure cooker intimidate you- just read the instructions carefully when using one. I do not use mine for cooking- although I know people that do. I bought mine strictly for canning. Hope all have a Blessed week! I am finishing up a few wedding projects this week and getting ready to go back to school! Gathering my supplies! 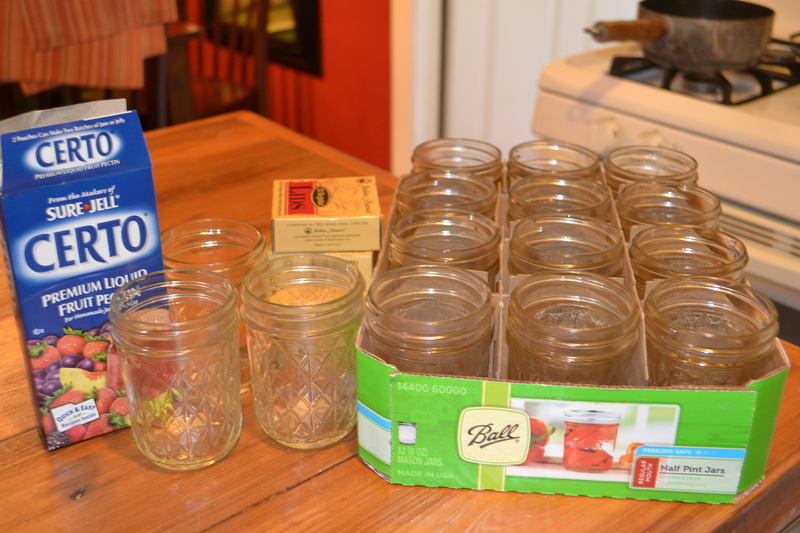 Now I know some people say that canning is expensive, and to get started, yes it is, but many of the supplies can be used over and over again. I have had my large hot water bath canner, pressure cooker, jars, wide mouth funnel, and rubber coated jar tongs for many years and will use them for years to come. The things that must be replaced yearly are really just the lids, I re-use my bands as long as they are free from any rust or dents. The lids are fairly inexpensive to replace yearly, a few dollars a dozen around my area. 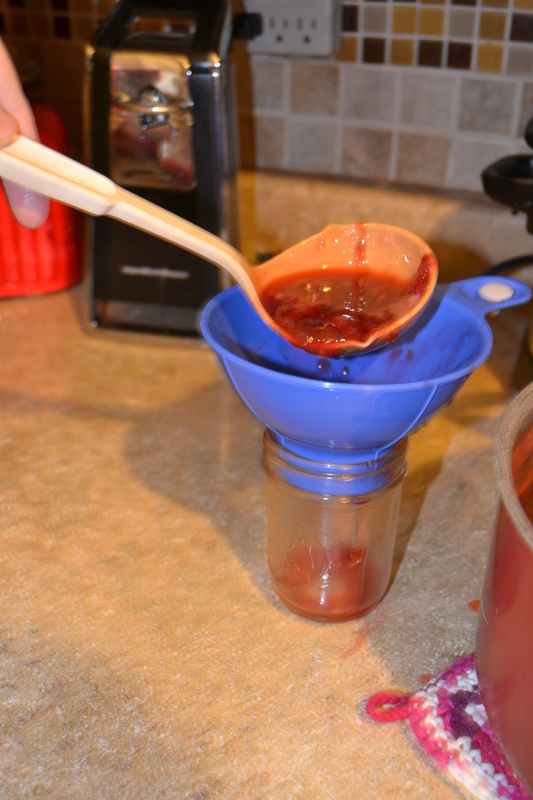 I also use the pectin when making my jellies and jams, which is a bit expensive. 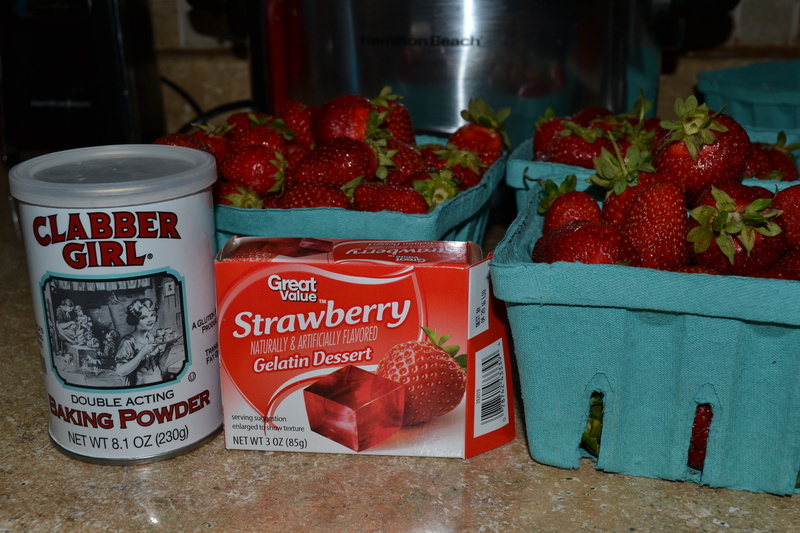 (I usually use the powdered pectin, but the store was out so I tried this gel pectin this time) The fruits/veggies you use can be cheap or free, depending upon where you get them. A friend gave me a huge box of mulberries a few years ago, so the only cost in the jelly was my lids and pectin, which was a total of around $4 for around 15 jars of jelly. 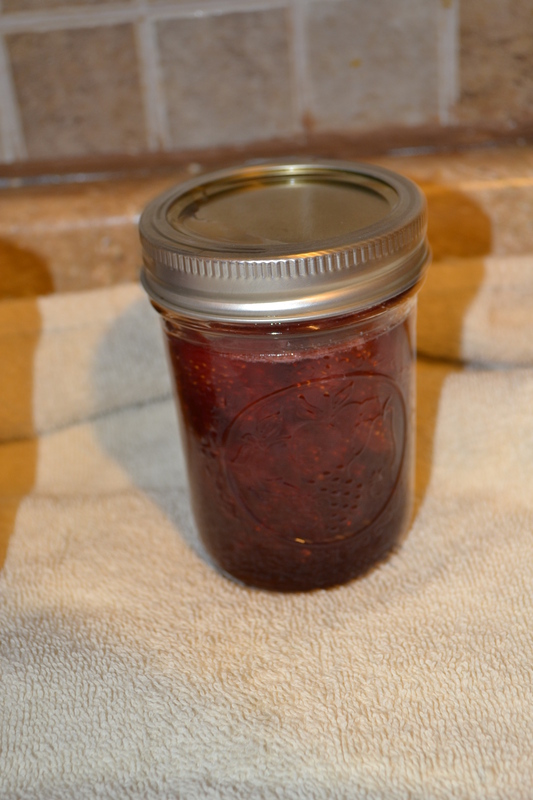 Now you can make jams and jellies without adding the pectin, because pectin is a naturally occurring substance in many fruits, it just makes it a bit quicker and the jams/jellies set up nice. I just follow the directions on the package of the fruit pectin for my jam. The store bought pectin is safe and natural, made from apple pectin. I do not add the butter, I just use a spoon and skim off the foam that forms on the top. 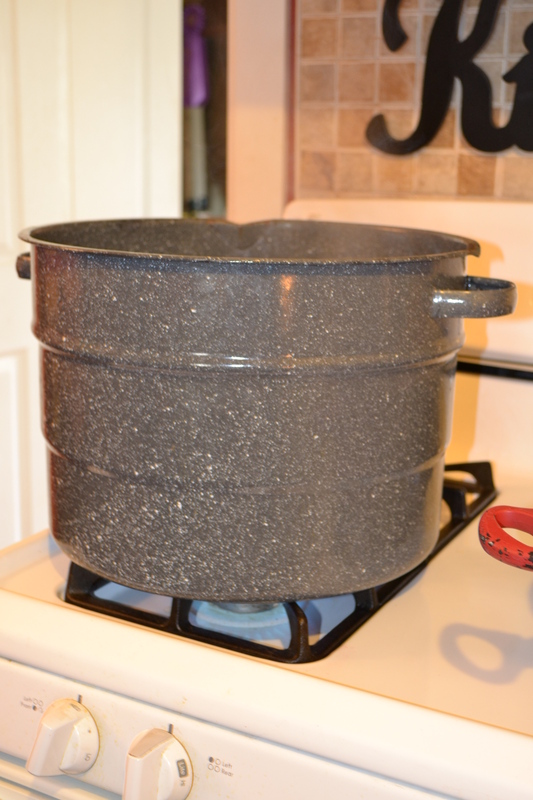 I go ahead and begin bringing my water in my big pot to a boil, because it takes a while. My canner has a rack in the bottom, so the jars are not sitting directly on the bottom of the pan. I use the small jelly jars, because it seems fresher to open a new jar more often. They are also very pretty for gift giving! A large mouth funnel is a must for jam/jelly making, I bought mine at a local dollar store for a few bucks years ago. 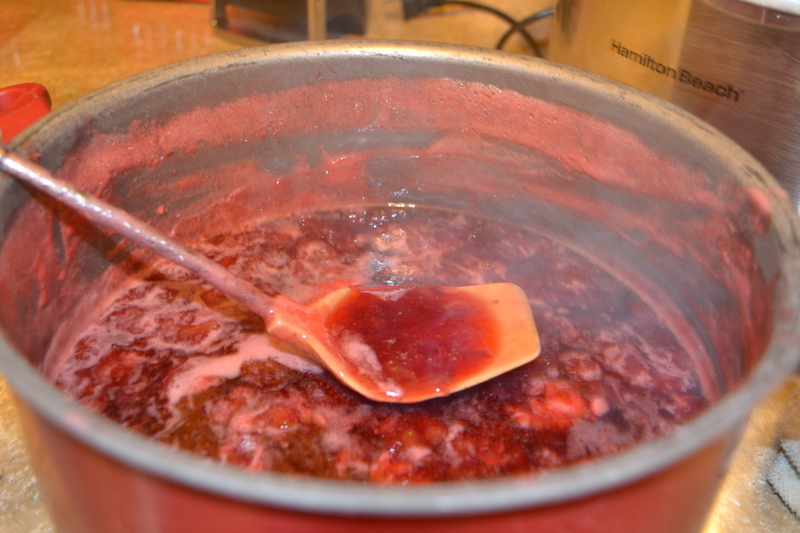 Once the jam has cooked according to the directions, ladle it into the jars, leaving a space at the top of the jar. Wipe off the rims of the jars to ensure a good seal. 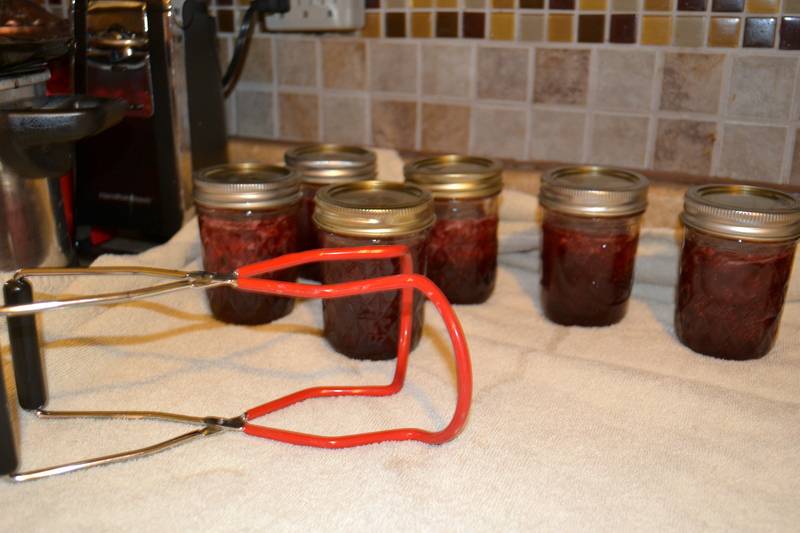 The rings and lids should be placed into boiling water, then using tongs place on the prepared jars of jam, I use a dish towel to tighten them down, as they are very hot. 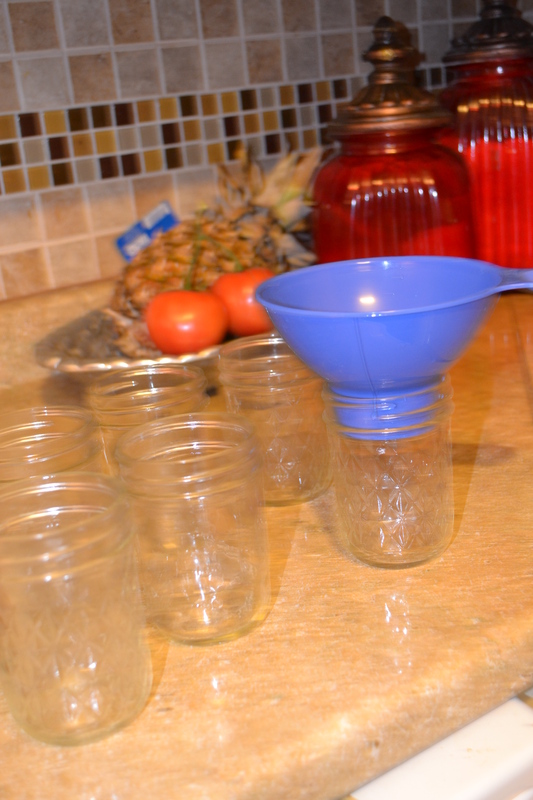 Then using my handy dandy jar tongs, I carefully place the jars into the boiling water canner rack and boil the specified time. When I remove them from the canner, I place on a clean dry towel on my counter, they will start popping (sealing) within a few minutes. Always check to make sure they’ve sealed, if they do not seal, just place in fridge to use first. Now it’s time to eat it! 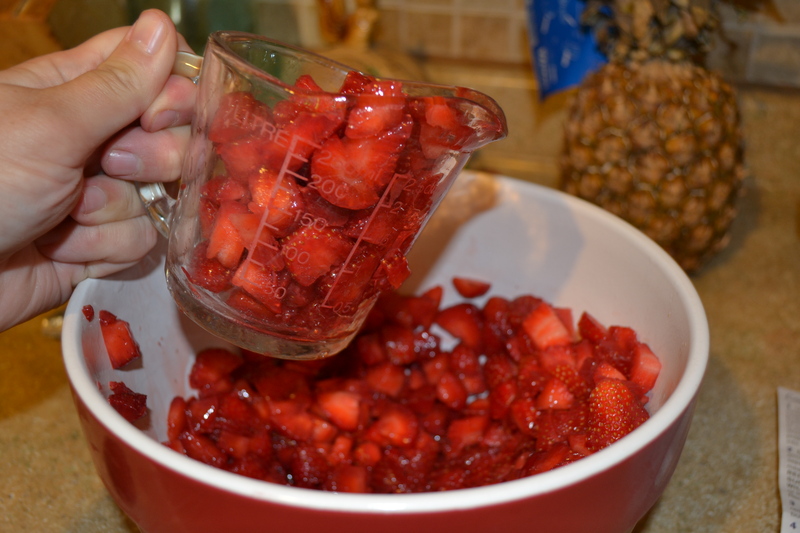 If your family loves strawberry ice cream topping or topping for waffles and pancakes, you can just leave out the fruit pectin( or cut in half the amount) and make yourself some topping. My family loves this! Make it just the same, just without (or less) pectin. It will not set up like jam, but will be pourable, perfect for toppings! Summer break for school has officially begun (although I have a few more days to work in my office) and I am so excited for summer! We are planning a few short trips this summer and I am so ready! I hope all have a very blessed week ahead!! 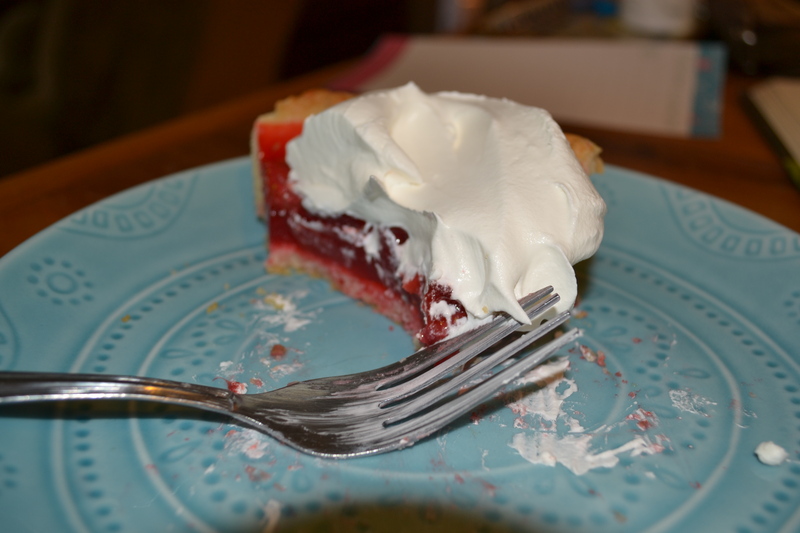 Fresh Strawberry Pie- Tastes Like Summer to Me! Okay, so for me the taste of summer is fresh strawberries and grilled anything! I just love summer: swimming, staying up a little later, spending time with family. 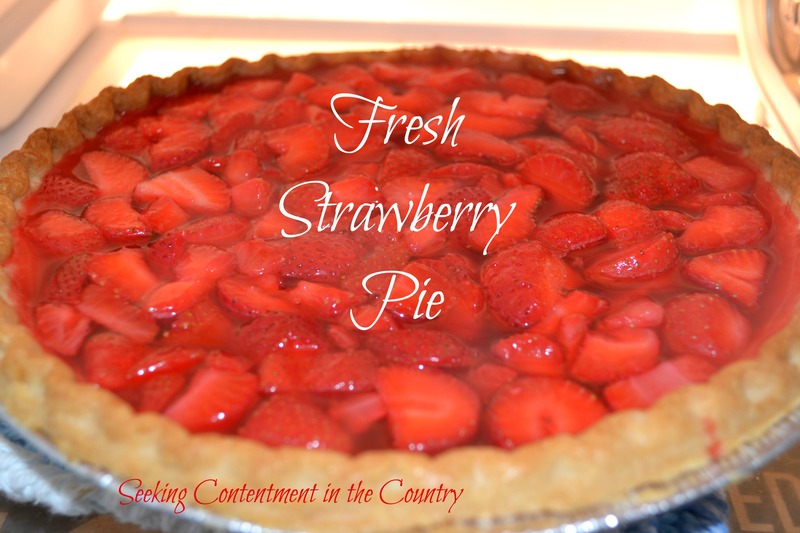 So in honor of it being so close- I am sharing with you my recipe, well actually my mother-in-laws’ recipe for fresh strawberry pie. Enjoy! I was able to visit a local Amish farm and purchase some mouth watering, just picked berries. Oh my were they ever delicious. My family and I ate 2 whole containers upon arriving home with them. I love getting fruits and veggies from their farm, I know they will be fresh and organic. I also bought some bedding plants for the garden from them, for my own fresh veggies later in the summer. So I know that this is not all “real food”, I mean jello and cool whip? Yes, I know those are fake junk,but remember I strive for somewhere around the 70-80% mark on my real food, I mean I still live in the real world. 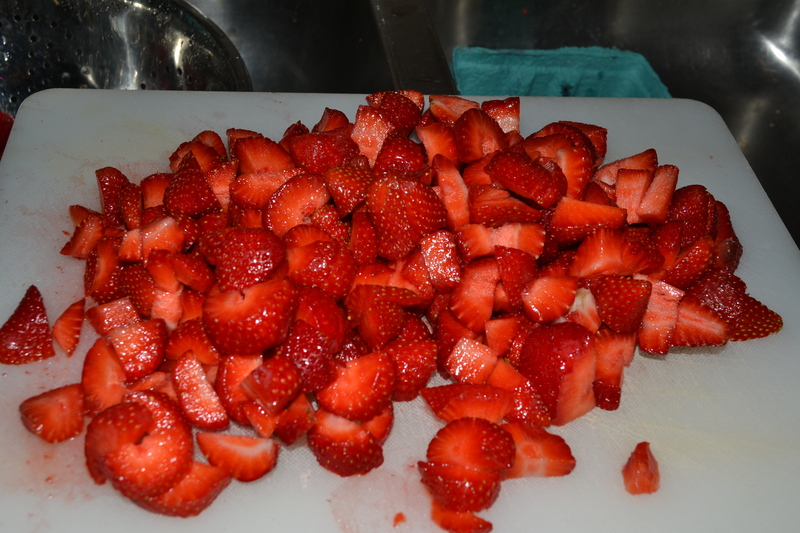 Start by washing/stemming and chopping up berries. I chop mine up pretty small, but that’s really up to you. 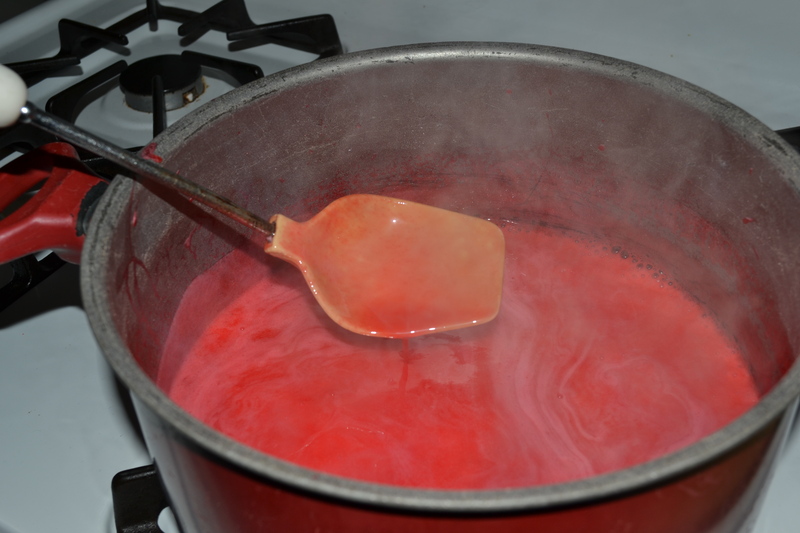 In a saucepan mix jello, sugar, cornstarch and water together. Cook and stir over low medium until mixture is bubbling and getting thicker.Remove from the heat and let cool slightly. Add the berries to this and pour into prepared pie shell (already baked). Place in fridge for a few hours until completely set up. Serve with Cool Whip if desired. Look at all that yumminess on that one little plate, oh my! I would love to hear what you think of when you think of summer, what are your “summer flavors” ? I hope all are having a super awesome week so far- and Happy Friday to all! Have a blessed day! 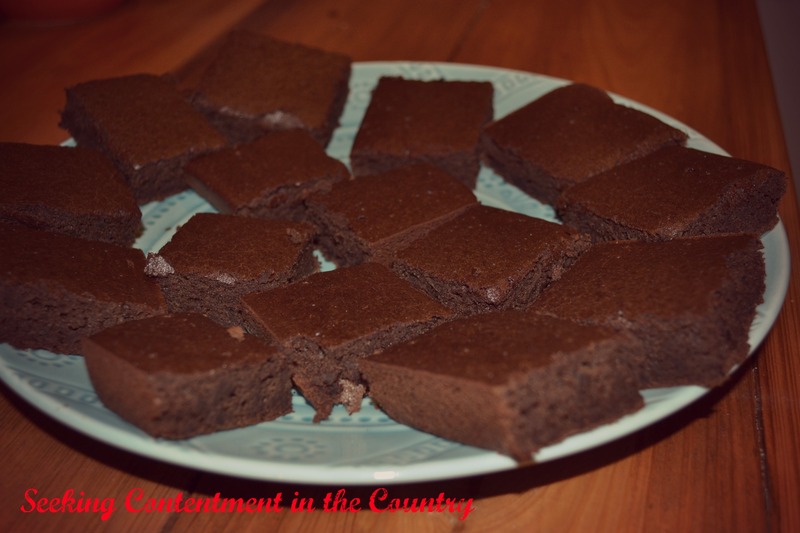 Brownies That are Healthy? Shut the Front Door! Okay so I love a good brownie, a peanut butter brownie, a hot fudge brownie, a cream cheese swirl brownie,well you get the idea. So, since I am on the quest for better health through better nutrition, I sought out a healthier version of brownies, so I could have my cake and eat it to- so to speak. Pinterest to the rescue! 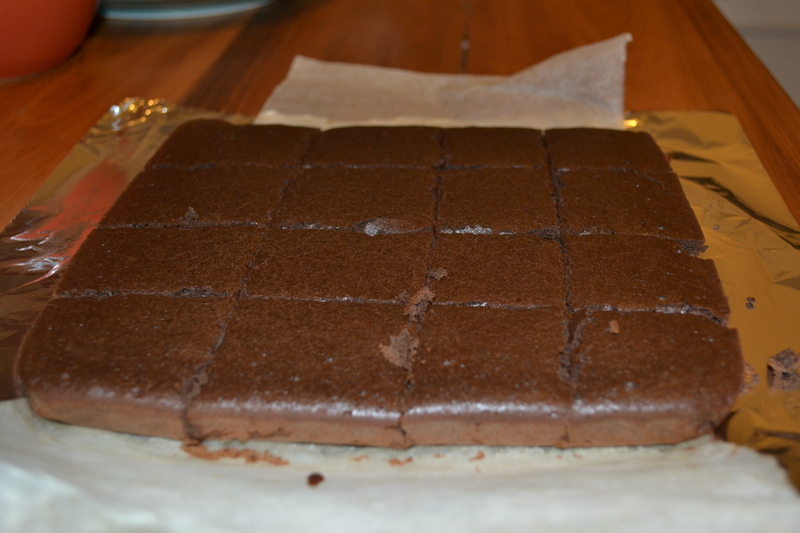 It brought me a ton of options for healthier brownies, one of which was Black Bean Brownies. So I sorted through a bunch of those and narrowed it to just one to try, and the results were a hit! Right out of the pan- hot and fresh! I then tweaked them a bit more, for my families preferences and the reduce sugar further. With the recipe I include below, cut into 16 squares, each brownie has roughly 90 calories, 3g protein, 3g fat and 1g fiber. I liked these, granted they are not a hot fudge brownie, they also do not have 250 calories, a ton of fat and no other “good” nutrients. 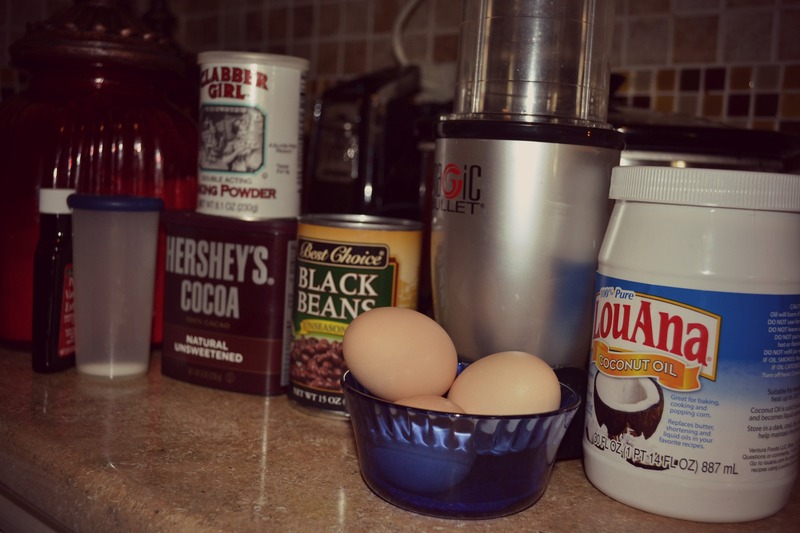 In a blender or food processor, puree rinsed/drained beans, coconut oil and eggs until smooth. (I used my Magic Bullet) In a mixing bowl combine cocoa, sugar, salt and baking powder. Add the bean mixture to the dry ingredients. Mix until well combined. Pour into a greased 8×8 square pan. Bake at 350* for about 30 minutes, or until tests done in middle. Cool and cut into 16 even squares. Enjoy the yumminess! I shared these with my co-workers and most liked them, some thought the texture was weird. I also made them for a school fair to focus on nutrition and most of the kids liked them, though again, some did not. The kids were ages pre-k through 6th. I hope all have a very blessed upcoming week! We have this week and next until summer break! 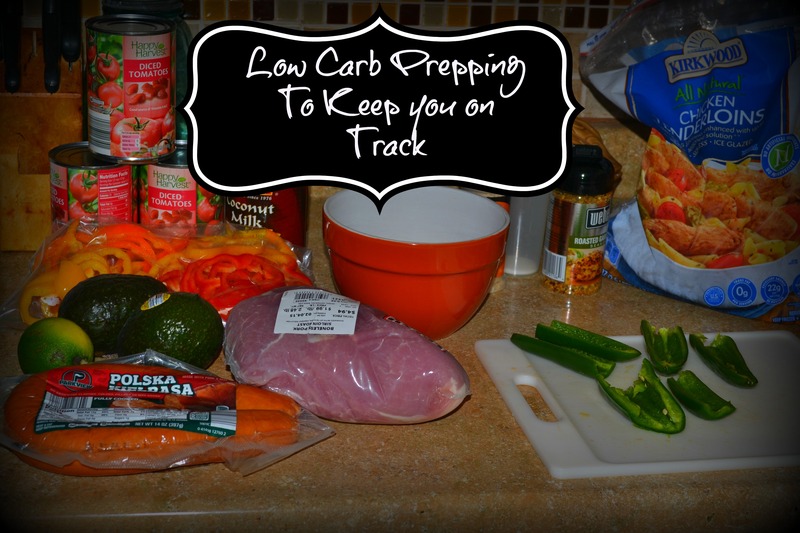 Low Carb Meal Prepping is Key to Staying on Track! So for the past few years I have been trying to stick with a lower carb diet, which is in my opinion, much healthier. It is not always easy, as most fast food is not anything like low carb. Even in the grocery store, most “quick” and easy to prepare stuff is just mostly junk. So again, meal prepping and/or freezer cooking comes in handy to stick to my plan. Here I planned for the upcoming week and “prepped” many of the meals or components of the meals. First off I jotted down my planner for breakfasts/lunches/dinners and snack foods. I then made a grocery list for what I was in need of (while looking in the freezers/pantry/fridge for items I already had). Went and bought groceries. 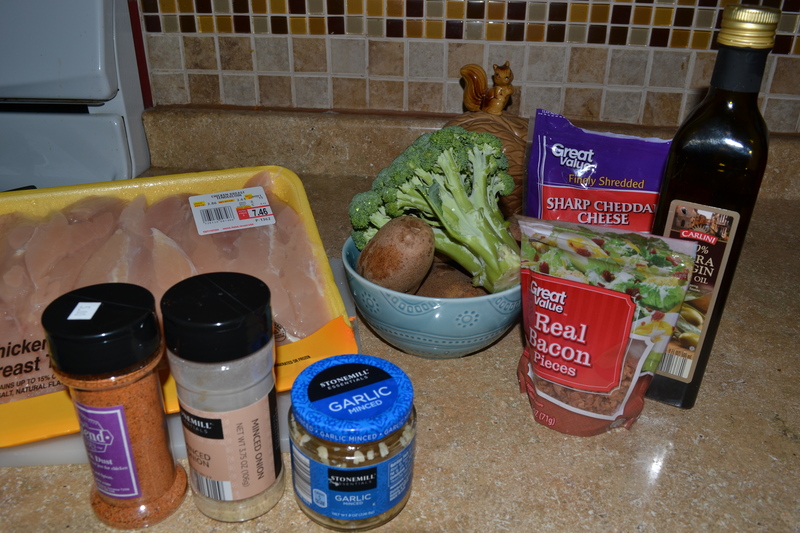 Then I prepped any ingredients or meals I could ahead of time. I chopped onions and peppers up. I placed all ingredients for the balsamic chicken into a freezer bag and tossed into the freezer until about Thursday, to cook on Friday or Saturday. I placed all ingredients for the Coconut Lime Chicken Stew into a freezer bag, but placed in fridge, since I will be cooking Monday. I cooked and crumbled the hamburger meat and placed in bag in the fridge. So there you have a week of super easy dinners- with just a little time on Saturday or Sunday, and it makes my work week so much easier! For Jalapeno Poppers, slice jalapeno peppers in half, stuff with a mixture of cream cheese, garlic powder, shredded cheddar, and salt. Wrap each half with half slice bacon and bake at 350 for about 13 minutes or until bacon is crisp. For my green beans- I just place a few bags frozen whole green beans into slow cooker, I add some dried onion flakes, chopped ham (or bacon if you have a slice or two leftover) a dash of liquid smoke and a bit of beef or chicken broth. Cook in slow cooker on low for 4-6 hours. I use boneless skinless chicken for mine, about 1lb, 2/3c coconut milk, 1/3c fresh lime juice,,1can diced tomatoes, 1Tbsp chopped garlic, 2 chopped bell peppers, 1 small onion, chopped, and a dash of Siracha sauce.Place all n slow cooker and cook on low around 6 hours. I serve with fresh chopped cilantro and diced avocado. Here’s to a week of great eats!! And remember, prepping ahead can make your work week much less stressful and will also help keep you on track! Have a Blessed Week! !